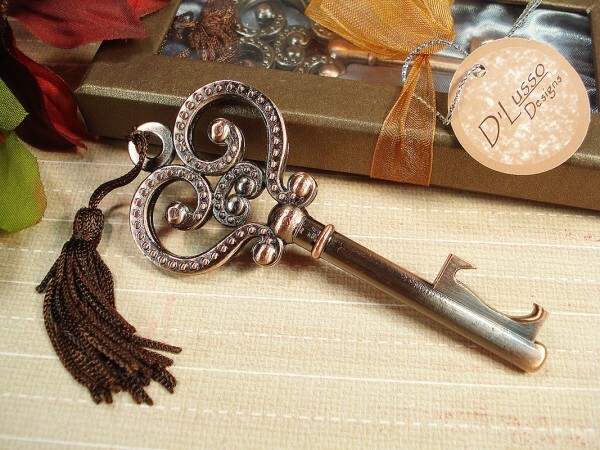 This lovely antique finish skeleton key bottle opener will impress your guests and leave an indelible impression as your choice for a favor. Crafted in colored metal, this practical favor comes packaged in a brown satin lined window box with ribbon and D’Lusso Designs hanging Thank You tag for extra elegance. Tassel included. Weight: 0.3 lbs Measures: 4"L x 1.75"W.